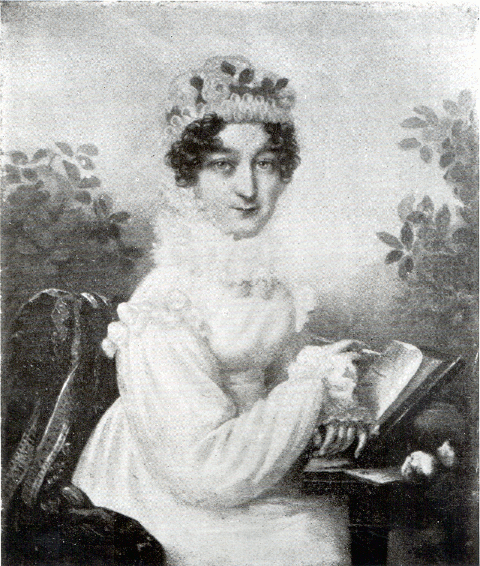 Cecilia was born on 8 February 1777 at Streatham. Her Godparents were Miss Owen, Mrs. Hester D'Avenantfn, daughter of Sir Lynch Salusbury Cotton, later Lady Corbet. and William Seward1. Cæcilia improves daily and is a lovely girl of the fair delicate kind … their is not a fault to find with either of them2 person or Mind; and I thank God who gave them me, their health is excellent. poor Cæcilia has got the Hooping Cough. Cæcilia grows more amiable, She has some fondness, & much flexibility: Amica di ognuno, Amica di nessuno6. should be Cæcilia's Motto. we teize her, & say She is like her own favourite Spaniel, who fawns upon everybody, & upon ev'ry body alike—but She says Phillis has her Distinctions. The little Cecllia is his Darling, & while She is at School will honour us with her Visits no doubt, but her Tenderness will end there I trust, as her Spirit is the same to that of her Sisters. Well! never mind, my heart is vastly more impenetrable to their unmerited Cruelty than it was when last in England. Let them look to their Affairs, & I shall look to mine: the World is wide enough I'll warrant it for Miss Thrales and Mrs Piozzi. Cæcilia improves daily and is a lovely girl of the fair delicate kind. Every body tells me that Cæcilia Thrale improves, & so I think She does; tho’ not because they say so: were She less altered for the better, no less would be said about her perfections I suppose. but She has lost much of the savage Manners She brought from School: is tamer, & handsomer, and grows very like what her Sisters were when they lived with me.—The Exterior is best tho’ with Cecilia; her Mind recovers more slowly than her Person, from a severe Shock certainly given to Both in the Year 1783 by the Hooping Cough & Measles together, when her younger Sister lost that Life which was preserved to this Girl only by Sir Lucas Pepys’s4 extreme Skill & Care. She will however be a fine Woman, with Accomplishments & Beauty & Virtue enough to accompany forty or fifty Thousand Pounds—although her Memory is far from strong, and her Spirit of Application to any Study much too weak ever to attain at Eminence I think. Her Temper when unthwarted is sweet, but She arms against opposition even instinctively; and will do nothing because She is commanded, but the contrary, while the same surly Independent Soul inhabits her Bosom with equal Rapacity to obtain, and Rage to appropriate, as in the hearts of any of her Family. Cecilia seems however to love Mr Piozzi—in her way of loving—but no one accuses her of partiality towards me I believe, whose Company She studiously avoids; & I therefore say nothing, but provide Refuges for her to recur to, that are no less improving Companions than myself—while She has Miss Weston, Miss Williams, Miss Lees, or Dear Siddons only for Confidents—She can hear of nothing but Literature, so I care not. Here's my Birthday returned; the first I have spent at Streatham for many Years, and quite the happiest I ever did spend there: Our daughter who lives in the house with us—Cecilia—much improved, & growing handsome as well as tall & rich; good as her Neighbours too, for ought I see; though without much Love of Study, or Regard for me, all goes well between us; and her Papa7 as She calls him, has a very solid kindness & true Goodwill towards her. I find he is of Opinion that Cator is no honest Guardian to those Girls, but I suppose they would rather be robbed by him, than saved by us. Youth and Prosperity have made her vain9. In 1784 when her mother left England Cecilia was left with Miss Nicholson. In the summer of 1786 she moved to Mrs Stevenson's school in Queens Square, London. In August 1794 Hester Thrale became Godmother to Cecilia Siddons - named after Cecilia Thrale - daughter of Sarah Siddons. Cecilia Margarita Battiste10 was also named after Cecilia Thrale. Cecilia was admired by many, including Samuels Rogers who met her at Edinburgh and Streatham. “;Oh Lord! Oh Lord! Mosty & Cecilia are run away to Scotland sure enough, and here is M r Piozzi in an Agony about his Honour wch he fancies injured by the step, Susan & Sophy are in Care for the Money which they unjustly fear is endanger’d ; Miss Thrale11 behaves best, & I suffer most—on Acct of her Health & Youth & Inexperience—Oh my poor Cecy!—for the 1st five Minutes I knew not but Drummond might have tricked her off with him pretending to be the other: but No, She is in safe & honourable Hands, and happy with her Dear Mostyn at Llewessog Lodge, where all seem rejoyced to receive & court her Attention.—This Business then is happily over, & I might sleep if Nervous Complaints did not hinder me—for now the other Girls are kind & good, & stuff Cecy, so do I, with bridal Presents; and nobody is otherwise than happy & content. 'Fedele & costante, felice e contento12' as my Master says. Her Temper when unthwarted is sweet, but She arms against opposition even instinctively; and will do nothing because She is commanded, but the contrary. frightened into fits on her wedding night, and that her husband had kindly and considerately got Dr. Haygarth to prescribe for her at Chester. 'I am got quite well now & am learning to behave better & an only as usual not to hurried & flurried but left to myself by Dr. H’s orders & then I shall soon be as good as he himself could wish. Cecy Mostyn is a foolish Girl, & cannot rule her own Household — all our unfashionable Neighbours cry Shame! to see Mason her Maid with Child by the Master of the Mansion & the Gay Mistress protecting this Partner in her Husband's Person because it is the Way She says; & all those who understand genteel Life think lightly of such Matters. When I offered to speak my antiquated Sentiments upon the Subject, She forbid me (smartly) to say another Word about it; & told my Maid that if Mrs Piozzi plagued her any more concerning such Nonsense She would leave the House into wch She never came to say the Truth except for mere Conveniency. They had three boys. The first died at birth on 28 August 1797 after her mother was in labour for "Three Days and Nights in Torture". The second was Henry Meredith Mostyn, also known as Harry, who was born in November or December 1799. Henry Mostyn had a distinguished career in Royal Navy and died in 1840. The third was Thomas Arthur Bertie, born 11 July 1801, named after Bertie Greatheed, second son of Samuel Greatheed, Whig Member of Parliament for Coventry and Lady Mary Greatheed. Bertie was a man of science interested in the latest inventions; and a writer. He wrote a play called The Regent in which he persuaded Sarah Siddons to take the leading part, but she miscarried on stage and the play was withdrawn. Thomas died early in life. On 12 October 1804, Cecilia miscarried a girl after falling from a horse. Cecilia and John Mostyn separated in 1805, once the boys were placed in Mr Davies' Streatham school. Cecilia took residence in Cheltenham, whilst John went to live in Bath for the health-improving spas. They were reconciled, but they separated again in Autumn of 1806. John Mostyn died of Tuberculosis on 19 May 1807 in Bath. Cecilia died on at Brighton Railway Station on 1 May 1857 aged 80. She was buried in St. Leonard's Church, Streatham and has a monument. Her collection of curiosities and relics of Mr. Thrale and Dr. Johnson was sold at Silwood Lodge, Brighton, in the autumn of 1857. 3. Sir Richard Jebb - physician to the King 1729-87. 4. a. b. Sir Lucas Pepys - physician to the King 1742-1830. 6. Friend of everyone, Friend of no-one. 8. Hester and Gabriel Piozzi. 10. John Salusbury Piozzi's sister. 12. Faithful & constant, happy and content. I am a historian at the University of Warwick, UK working on domestic service in the later eighteenth century I have long been interested in Hester Thrale Piozzi's remarks about the early days of Cecilia Mostyn's marriage, and her claim that John Mostyn fathered a child on her maid Mason (Thraliana, Vol. 2, p.967; 11 October 1796). I am of course, interested in the maidservant rather than the Mostyn's or the Thrales, but am rather hampered in pursuing Mason through - possibly - Poor Law Records and Denbighshire County Records in general, by not knowing her first name. Does anyone know any more about the maidservant? I really don't think this episode has been written about by anyone, and though I'm willing to strike out into Denbighshire with minimal information, really, I don't know if the child was born in the parish of Llewesog, or indeed, if there ever really was a child. I'd be so grateful if you could give me any tiny scrap of information. Your website is extraordinary - extraordinarily wonderful and beautifully arranged. First, please accept my apologies for the delay in replying. I am afraid I cannot cast any light on Mason. In fact this was a fact that I had overlooked. I have since re-read the reference that you mention in Thraliana - very interesting! I have taken the liberty of including this snippet of information on my Cecilia page.